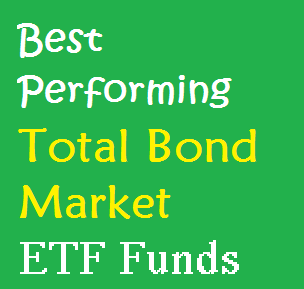 Discover best performing total bond market ETF funds 2014. 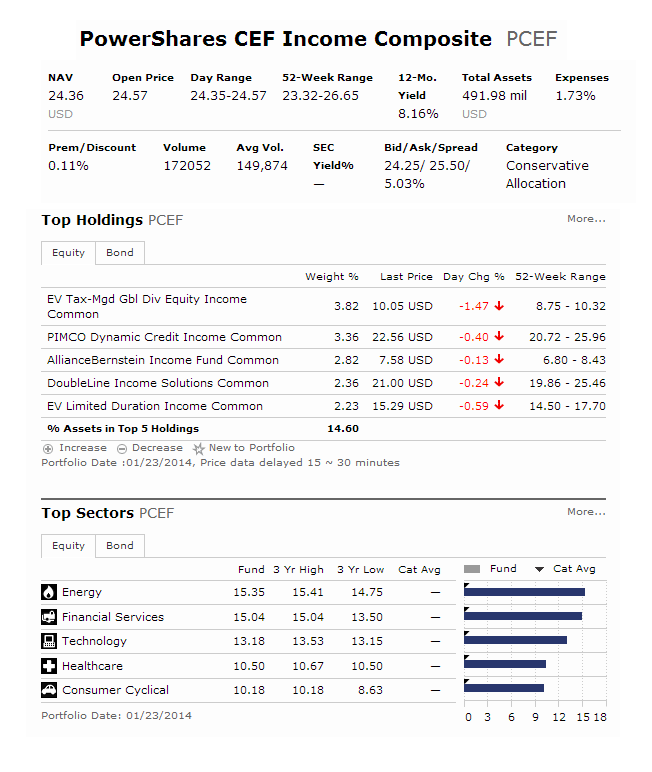 Top funds are CEF Income Composite Portfolio, iShares Core Short-Term U.S. Bond ETF, etc. Bond exchange traded funds are another popular ETF’s sector. Some of these exchange traded funds are passively managed or actively managed. The passively managed bond fund is tracking its index, while actively managed fund is similar to bond mutual fund and managed by manager(s). These total bond market funds provide income by investing in high quality debts including government or corporate debts. These top total bond market exchange traded funds is sorted based in 1 year performance up to January 29, 2014. Find the fund review whether they are good for your brokerage account or 401k plan or individual retirement account (IRA). Check the fund holdings, return, expense ratio, etc. PowerShares CEF Income Composite Portfolio fund invests mainly in securities of funds included in S-Network Composite Closed-End Fund Index. It also has a high yield of 8.42%. The current shares price is $24.27. The best performing ETF fund has an expense ratio fee of 1.73%. Morningstar has ranked this total bond market exchange traded fund with 3 stars rating. With total assets of $489 million, it has returned 0.59% over the past 1 year, and 6.77% over the past 3 year. The top 3 holdings are Eaton Vance Tax-Managed Global Dividend Equity Income Common, PIMCO Dynamic Credit Income Common, and AllianceBernstein Income Fund Common. As a new ETF, iShares Core Short-Term U.S. 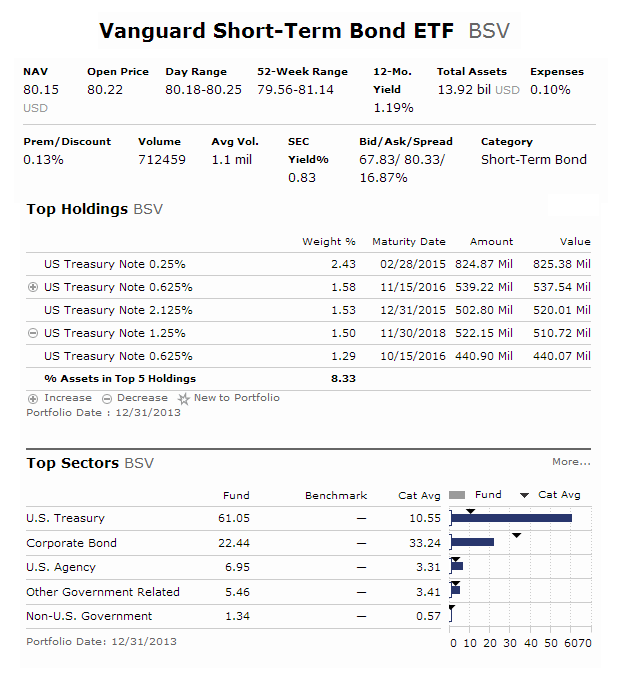 Bond utilizes its assets to purchase high quality short duration U.S. debts including government & corporate bonds. In 2013, this best ETF has total return of 0.62%. The expense ratio fee is only 0.12% per year. The current yield is 0.60%. This top short term bond fund has an average duration of 2.61 years. The top 3 sectors are U.S. Treasury (60%), Corporate Bond (24%), and U.S. Agency (6.6%). The fund has an average credit quality of A.
Vanguard Short-Term Bond ETF is a 2 star rated exchange traded fund. With yield of 1.19%, this best ETF fund has total assets of $13.92 billion. The expense ratio fee is 0.10%. The 52 week range price is between $79.56 and $81.14.